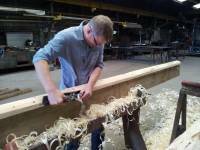 The making of timber ladders. Current no. of skilled craftspeople 6-10? Until the 1960s wooden ladders were widely manufactured in the UK. With the introduction of aluminium ladders the wooden ladder trade declined. There was still demand for the wooden type, but it was cheaper for customers to purchase on the second hand market – a supply that was plentiful with so many users converting to aluminium. Today, Network Rail and many UK electricity companies will only use timber ladders as no other material does the job, ensuring that there is a market. Timber is non-conductive and is nicer to user in adverse weather than glassfibre (also non-conductive), and timber ladders are more economic because they can be easily repaired (rather than having to be replaced). Films showing the process of making a wooden ladder, along with technical drawings, can be found on the Heritage Crafts Association’s Wooden Ladder Making project website. There is a strong and stable market for timber ladders. Network Rail and many UK electricity companies will only use timber ladders as no other material does the job, ensuring that there is a market. Timber is non-conductive and is nicer to user in adverse weather than glassfibre (also non-conductive), and timber ladders are more economic because they can be easily repaired (rather than having to be replaced). A. Bratt & Son Ltd. – founded in 1895. Make timber steps, ladders and platforms (as well as glassfibre, aluminium and steel ladders). Make timber ladders for the electricity industry and for fruit picking, as well as specialist ladders for bespoke commissions. Have 12 people in the factory, 3-4 of whom specialise in timber ladders, and one trainee. Make timber ladders to British Standard kitemarks. LFI – based in Gloucestershire. Make some timber ladders, as well as aluminium and steel ladders. Stanley Clark – based in Northampton. Now retired. As part of a Heritage Crafts Association training programme, Stanley passed on his skills in a workshop and there are now several people with the basic skills to make bespoke wooden ladders completely by hand. It is believed that there are also one or two companies who repair timber ladders. Number of trainees: A. Bratt & Son Ltd. have one trainee who will learn all aspects of the ladder making trade (including timber, glassfibre, aluminium and steel). In 2014, 10 experienced woodworkers took part in a workshop to make a wooden ladder with Stanley Clark, a retired timber ladder maker which was recorded. While this was only a short course, the basic skills have been transferred.